Only the Matrix IR™ elōs™ fractional applicator combines Fractional Optical Energy with Bi-Polar Radio Frequency (RF) to produce deep dermal heating to effectively treat wrinkles. Powered by elōs Technology, Matrix IR Fractional Treatment delivers industry-leading results that your patients will love. The Matrix IR applicator uses a proprietary synergy of light and conducted Bi-Polar RF to create the deep thermal heating needed to both shrink and generate new collagen while protecting the epidermis. The Matrix IR combines a diode (915 nm) laser matrix, bi-polar conducted radio frequency energy and intense epidermal cooling. 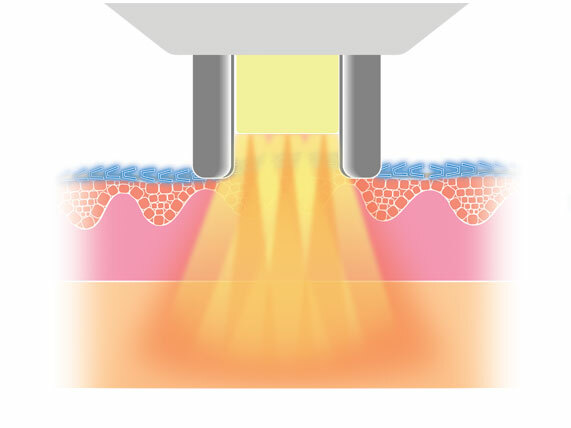 Use of this combination of modalities results in overlapping light beams penetrating deep into the dermis to a depth of up to 2.5 mm to pre-heat the target tissue, and the RF energy being drawn to the target. This puts the thermal zone where it is effective for wrinkle treatment, while being gentle on the epidermis. How does Wrinkle Treatment with elōs™ work? 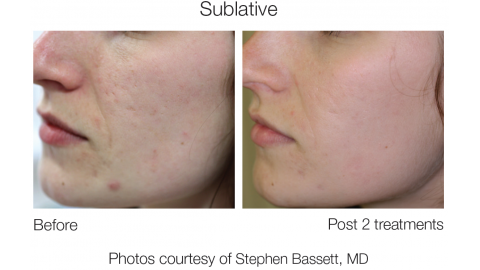 The MATRIX IR combines safe and effective levels of laser and radiofrequency (electric current) energies to remodel the dermal layer of the skin by stimulating new collagen growth, creating a smoother and softer appearance. 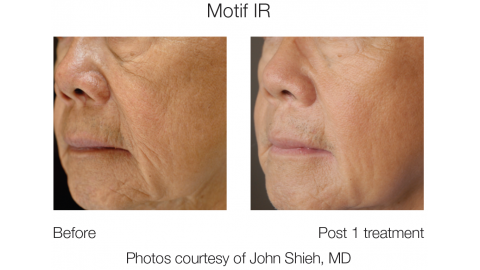 Both laser and radiofrequency have been used separately for decades in medicine and surgery, but the MATRIX IR exclusively combines light and radio-frequency energy for ideal treatment outcomes with a very low risk of side effects and virtually no down-time. 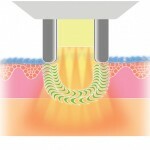 What results can one expect from elōs™ wrinkle treatment? How frequently does one need treatments? 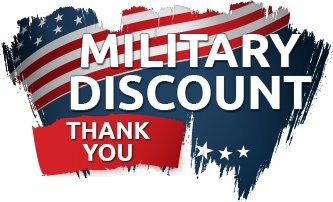 Treatment sessions are typically 3-4 weeks apart. How is elōs™ treatment tolerated by the patient? The sensation may be described as a “hot pinch”, like someone snapping an elastic band on your skin. Patients tolerate treatment well by use of either cooling the skin during treatment and/or use of a topical anesthetic cream that numbs the skin. Is treatment with elōs™ safe? Any medical laser procedure has risk of side effects such as superficial blistering, crusting, and pigmentary changes in the skin. These risks are rare and usually quickly resolved. elōs™ incorporates several technological advances that focus on patient safety to minimize these risks and provide greater satisfaction. The laser hand piece is also cooled for skin protection and comfort during the procedure. Who should be treated with elōs™ technology for wrinkles? Anyone with unwanted moderate wrinkles, superficial acne scarring, enlarged pores, or rough skin texture from chronic sun-damage. 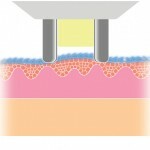 Pigmentation from chronic sun-damage may also improve over the series of treatments. Dynamic wrinkles such as between the brows or deep folds near the mouth/nose are not realistic indications for MATRIX IR treatment.